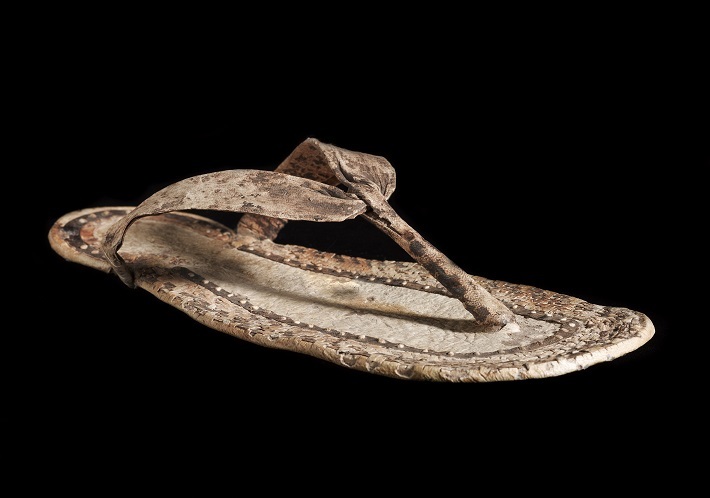 Image: Woven sandal in gazelle leather could be the oldest thong in Australia. The acquisition of the ancient Egyptian footwear marks the celebrations for the 60th anniversary of the UNE Museum of Antiquities in Armidale, Australia's first regional museum of ancient history and archaeology . Dr Bronwyn Hopwood, Senior Lecturer in Roman History and Curator of the UNE Museum of Antiquities, said that the ancient sandal is more than 3000 years old. “We are thrilled to add such a rare and interesting ancient Egyptian artefact to our collection,” Dr Hopwood said. “While the basic design appears the same as Australia's most iconic footwear it also demonstrates how the art of individually crafted footwear has changed drastically over the centuries, to the mass produced shoes we all wear today. “The sandal is even more extraordinary because where most of the shoes surviving from ancient Egypt are made of reed-work, this one is made of leather. “Being made of gazelle leather, we know that it probably belonged to a very wealthy person and the leather is in excellent condition. “This artefact shows us an aspect of daily life in the ancient world and will be an invaluable teaching aid for our students in Classics & Ancient History and of interest to all of our museum visitors. The leather artefact was unveiled as a part of celebrations at the 40th Annual Conference of the Australasian Society for Classical Studies (ASCS), hosted by UNE this week and attended by 200 scholars and enthusiasts. The sandal originates from Ancient Egypt, circa 1550-1069BC and was formerly held in the private collection of Kurt Kramer, Karlsruhe, Germany, c.1960. The artefact was purchased with the assistance of the A.G. & I.C. McCready Fund which supports the Museum of Antiquities' Egyptian collection. The Museum of Antiquities at the University of New England is open to the public and the community is welcome to view the collection. A gazelle leather sandal with central thong. The sandal is decorated by a thin dark band encircling the central sole and heel, and an elaborate checkerboard pattern between the band and outer edge, created by the use of darker leather. The exposed underside of the sandal reveals the stitching technique. The leather is in excellent condition. The side straps have been reattached. Most sandals surviving from Ancient Egypt are made of reed-work, whereas examples in leather were worn by the very wealthy and are therefore comparatively rare.